We are extremely pleased to welcome Carlos Perez, P.Eng., M.Sc., as a Senior Transportation Engineer in our downtown Vancouver office. 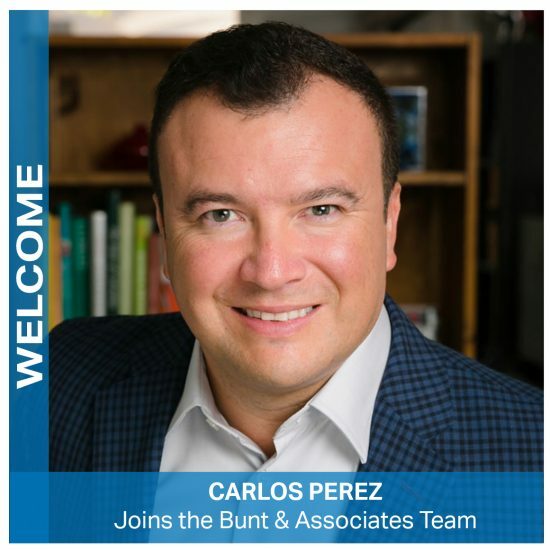 Carlos comes to Bunt with more than 20 years of experience in both the public and private sectors with a focus on municipal and regional transportation planning, travel demand forecasting, business case development, public engagement in transportation initiatives, and street design for all-ages-and-abilities. In addition to his technical expertise, Carlos’ leadership focus is on building professional teams that value cross-functional working relationships for exceptional design and implementation of strategies, plans, and projects. Having spent more than half of his Canadian career in municipal settings, Carlos’ role with us will be pivotal in building strong relationships with municipal and regional clients and in delivering Bunt’s excellent transportation services. Learn more and connect with Carlos by visiting his profile on Our People page.